"Louis Armstrong's All-Time Greatest Hits"
Megadeth--Killing Is My Business...And Business Is Good! There certainly isn't music like this anymore -- Louis Armstrong's music defines classic Jazz, and his popularity soared decades after his death, when his song "What A Wonderful World" was featured in the Robin Williams movie Good Morning Vietnam. Likewise, his music has also been featured in other movies, such as "A Kiss To Build A Dream On" (Sleepless In Seattle). He would only have one #1 song, the famous "Hello Dolly," as it bumped The Beatles' "Can't Buy Me Love" out of the #1 spot in the first week of May, 1964. 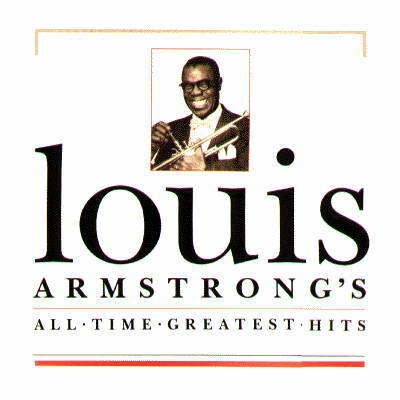 Louis Armstrong's All-Time Greatest Hits captures a very enjoyable hour of his well-known songs and more. The obvious hits are here, as the ones mentioned in the first paragraph of this review. Other songs are his version of "Mack The Knife" as it is more jazzy than the most popular version, by Bobby Darin. Even "That Lucky Old Sun" has a great quality to it, as did Frankie Laine's original and re-recorded version. And then there's his version of "Kiss Of Fire" which will bring some memories for some who remember "anyone" who had recorded this song before him. "Gone Fishin'" with Bing Crosby is another well-known popular song, for those who remember. Another version is Edith Piaf's "La Vie En Rose," as both the instrumentation and vocals blends extremely well. The "unfamiliar" songs such as "Sittin' On The Sun," "It Takes Two To Tango," are just as enjoyable as his popular hits. Even "(When We Are Dancin') I Get Ideas" has a very pleasant touch, both his trumpet playing and vocals are exceptionally sweet. "Skokiaan" focuses more on the instrumentation of the standard New Orleans Jazz, as Armstrong's vocals do have its part later in the song. "The Dummy Song" is anything but -- very upbeat and jazzy. "Chloe" showcases Armstrong's excellent trumpet playing, and having an exceptional vocal chorus, likewise his vocals are truly sweet as well. "I Still Get Jealous" is upbeat and jazzy, and has a similar musical style as "Hello Dolly," as it was one of the songs from his original Hello Dolly release. Pleasant Jazz is best described for "When You're Smiling (The Whole World Smiles With You)," likewise "When It's Sleepy Time Down South." For any fan of music, Louis Armstrong's music will bring a warm, healthy smile to any one's face. His excellent trumpet playing and unique voice as his standouts, Armstrong's music has always captured the hearts of Jazz and music fans alike, during his life and after his death. If you haven't taken the chance to discover his music, it is well worth it, as you will want to hear more and more. © WSVNRadio.net. All rights reserved. Review or any portion may not be reproduced without written permission. Cover art is the intellectual property of MCA Records and is used for reference purposes only.